First, there was soap. In 1857, Colonel Lewis Cowan built his eponymous Soap Works on the later site of the Harrods Depository (as shown in the 1888 map to the right). 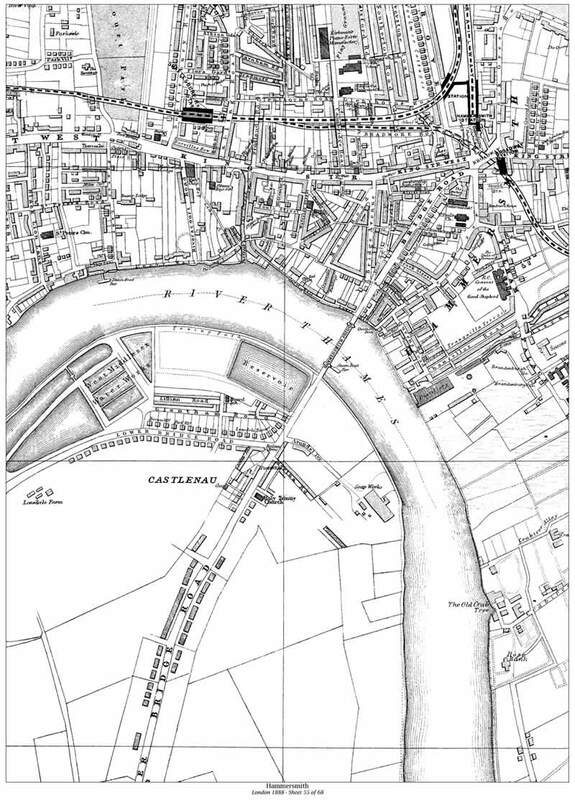 Cowan also added factories to refine sugar and make candles, establishing the Hammersmith Bridge Works [as it was then called] as a major local employer. In 1888 a fire destroyed the entire sugar refinery but left the buildings housing soap and candle-making sufficiently intact to become two of the later Harrods’ depositories: Charles Harrod (soap) and Richard Burbidge (candles). Up to this date, the Works employed some 1,000 men. Following the fire, 500 lost their jobs and soup kitchens sprang up to help impoverished local families. 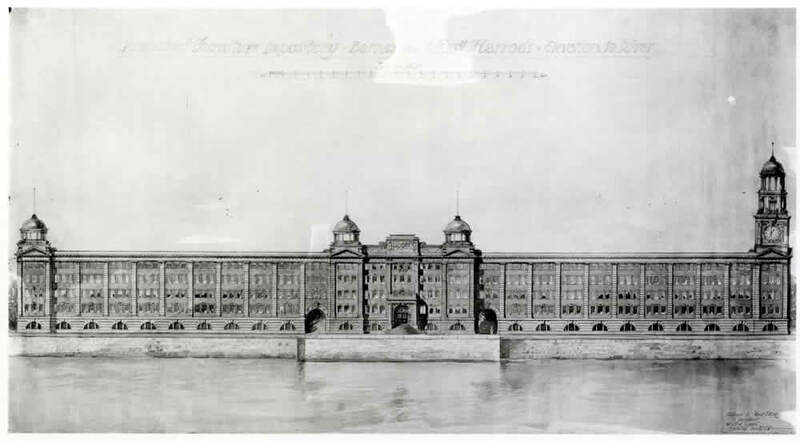 The Works never recovered and closed in 1892, leaving the site open to Harrods to acquire it and remodel the buildings as depositories for large items of furniture waiting for shipment to clients or to the Harrods store itself in Knightsbridge via its own Thames-side landing stage. The term ‘warehouse’ hardly does justice to the two original buildings, far less the newer building designed by William Hunt in the 1890’s and finally completed in 1913. The grand façade borrows features from Lutyens’ designs for government buildings of the British Raj : two ornate domed towers, bands of red and yellow brick and stone, and faience tiling. 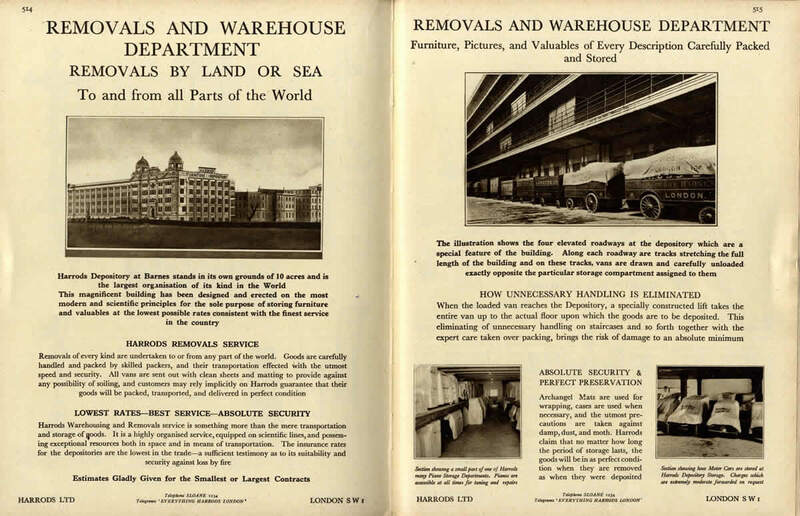 The whole complex could also now accommodate the storage of personal belongings - such as fur coats and wraps - temporarily surplus to requirements in the far flung hot corners of the British Empire. Now a Grade II listed residential apartment block, William Hunt Mansions is a visual marker point for TV coverage of the Oxford and Cambridge Boat Race as the boats sweep towards the iconic Hammersmith Bridge.